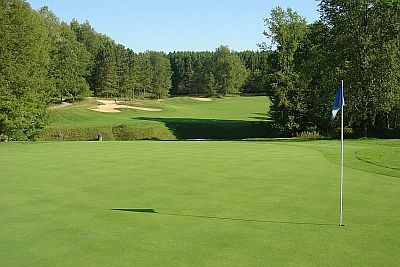 Nestled in the heart of the Manistee National Forest, the Peaks Course is a unique world class golfing experience. Golf course architect Harry Bowers has done a magnificent job of designing the course to fit with the natural beauty of the surrounding land by using the knowledge and talent gained from his many years tutelage under Robert Trent Jones, Sr. His love of the land and sense of the environment is obvious throughout the course. The golfer crosses 10 bridges as he winds his way through a beautiful two mile nature trail. Each hole has its own unique personality providing a different and exciting challenge and complete isolation from other holes. 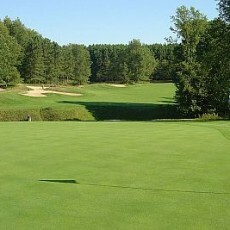 All holes have a minimum of four different tee locations. The par-36 course will play 3341 yards from the back tees. The forward tees will play 2186 yards. Striking views, giant 75′ trees lining the fairways, miles of forested hills and valleys unblemished by condominium or housing developments, roads or farms, provide only pure wilderness land for the golfer to enjoy. The views are rare and not available from any other golf course in the Midwest.